How Do Zeolites Remove Impurities in Water Filters? There are many different methods for removing impurities from our drinking water or the water that feeds out entire house. One method is the use of a zeolite bed to remove ions that contribute to water hardness like calcium and magnesium through ion exchange. Zeolites are minerals that are structured such that there are many pores and surfaces for positive ions to attach. In chemistry, surface area is very important to how minerals interact. Because of their porous nature, there is a lot of surface area in zeolites leaving more spaces for the ions to deposit. A fresh zeolite bed in a water filtration system will have a zeolite resin with sodium ions attached in as many of the pores and crevices as possible. Hard water contains positive ions such as calcium or magnesium. These elements carry a positive charge of two while sodium has a positive charge of only one. As hard water passes over and through the zeolite bed, the more positively charged ions in the water are attracted to the zeolite bed and the negatively charged mineral is more attracted to them than the sodium ions. The sodium ions are dropped and the calcium and magnesium start to fill in the pores and crevices. The sodium ions are exchanged for calcium or magnesium ions, hence the name ion exchange. When all of the pores and crevices are full of calcium and magnesium, then the zeolite bed needs to be regenerated so you can continue to use it. We need to get the zeolite to drop the calcium and magnesium in favor of more sodium. The way this is accomplished is by passing a heavily brined water solution through the bed. The chlorine ions are much more negatively charged than the zeolite so the calcium and magnesium are attracted to them. The sodium leaves the chlorine and attaches itself back on the zeolite. 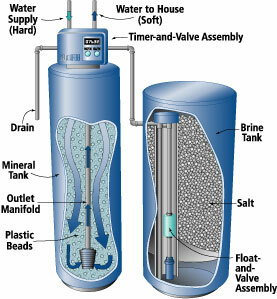 A whole house water filter is a filtration system meant to treat all of the water that comes into your house. That means the water used in your kitchen, toilets, showers, and laundry all has been treated by the whole house water filter system. You usually install whole house water filter systems after the water line comes into your home but before there is a split to the water heater. The only water at your house not treated by whole house water filters is yard water. The reason for that is that municipal water lines typically split into house water and yard water at the street level or somewhere in your home’s foundation. Whole house filters are sometimes called water conditioners because they combine filtration of contaminants with water softening which is the removal of hardness minerals to condition your water fully. However, when it comes right down to it, water softening is just another form of water filtration so we will call the systems whole house water filters. There are several different kinds of whole house water filters depending on what kinds of contaminants you are looking to treat or eliminate. The first variety is what is called a sediment filter. Sediment filters are filters that use mechanical means to remove particles that are visible in the water. Those mechanical means usually mean mesh filters. The smaller the mesh, the smaller the sediment particles it can remove. Some systems start with large mesh and the filters get progressively smaller as the water travels through the filter system. If there is a lot of sediment in your water then you probably want to use reusable water filter cartridges rather than disposable ones because they will be clogged more easily. Sediment filters are also useful in removing red water iron or rust. Again, if the rust content is high, you want to use reusable filters so that the cost of replacing filters is not too great. Another kind of water filter is for removing chemical contaminants. Most whole house water filter systems use carbon filtration because it will remove the common chemical contaminants found in most municipal water. Chlorine is the chemical of greatest concern to most consumers. 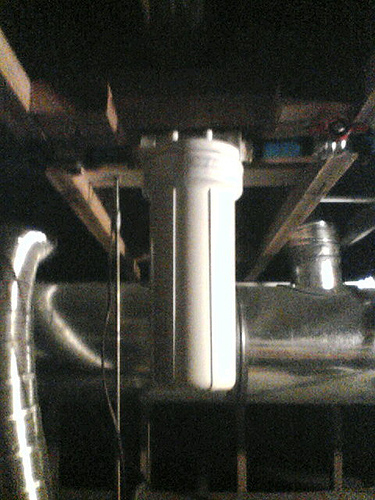 A whole house carbon water filter works extremely well to remove chlorine. The third most common type of filter used in whole house water filtration is an ion exchange filter. This is the method used for removing water hardness minerals and clear water iron. Clear water iron is dissolved iron and is sometimes called ferrous. Depending on what contaminants are present in your water, you could use one of these types of filters or a combination of whatever kinds are necessary. If you are not sure what is in your water and you use well water, then you can have your water tested by a water quality testing company. If you have city water, then you can contact your local water department for a report of the quality of your water. Some whole house water filter companies will review the water quality report and recommend what kind of filtration system you need. Usually the whole house water filter reviews are a free service. When you have decided the type of whole house water filter that you need to deliver quality water to your home, then there are a few characteristics of the filtration system that you need to consider to make sure you will continue to receive enough water under the appropriate amount of pressure once your whole house filter is installed. The first thin to look for is the throughput or how many gallons per minute are delivered through the system. Look at the capacity ratings of all of your appliances that use water like the toilets, dishwasher, showerheads, and washing machine. Add up those numbers so that you know how much water you would need to run everything at the same time. It is not likely that you would need to do this, but it is possible and you want to make sure that your water filter will allow for it. Most typical households will need somewhere between fifteen and forty gallons per minute. Make sure that your whole house water filter is rated for something slightly higher. The reason you want something higher is that the gallon per minute might go down as a whole house water filter cartridge becomes clogged or spent. You also want to consider the filter size. The larger the filter the longer you can go between servicing and the more water at greater pressures you will be able to run through the system. A typical whole house water filter will be four and a half by twenty inches but for a large house, they could be bigger. The filters also have a lifespan associated with them. Pay attention to that lifespan so that you will know how often the whole house water filters need to be changed. A typical filter will have a lifespan of one hundred to one hundred and fifty thousand gallons. Finally, make sure that the port size of the whole house water filter system is as large as or larger than your pipes. Most household have three quarter inch pipes and one inch ports of their filters so there is no pressure drop as the water leaves the filter and enters the pipes.